Shwegugyi Pagoda is situated in the valley between Shwetaung and Myawtawgutaung. The pagoda was built at the year of accession of king Min Bar. The pagoda has the substructure at the base, and the superstructure in the form of the inverted bronze bowl, is above it. The conical pagoda was erected at the top. The great pagoda is surrounded by four small pagodas. 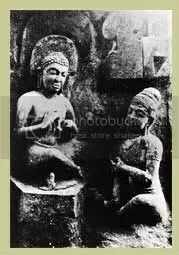 The sitting Buddha image made of the single stone, is in the perfumed chamber. The figure of Vishnu conveyed from Hindu Nat Shrine, is at the entrance to the cave. Both sides of the entrance porch have the stone sculptures in the form of paying homage to Buddha image. Nowadays, the whole pagoda was covered with the golden robe. The board of trustee preserves the pagoda.